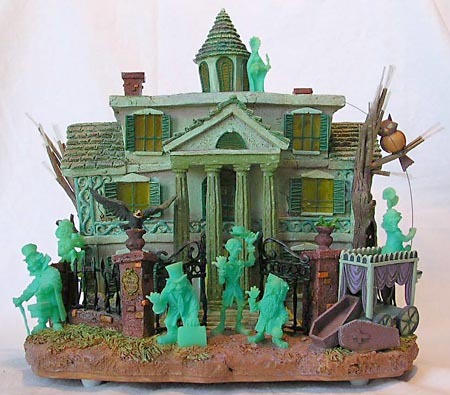 Wow, this thing is really so cool, I have no idea where to begin ... it's definitely inspired by the New Orleans-style Disneyland Mansion, though it is very off-model. It actually reminds me more of some of those concept paintings they now have for sale at the Disney Gallery. At any rate, this Mansion is much more run-down than the actual ride façade (whose upkeep is pristine as per Walt's famous decree) and while it's not accurate to the ride the whole piece has a very singular style that makes the whole really cool - very aesthetically pleasing. The front of the Mansion features the three Hitchhiking ghosts posed in front of an open gate, complete with a really bad "recreation" of the ride plaque on the left side column. On top of that column sits a raven ready to take flight. On the righthand side sits a hearse with driver - undoubtedly a reference to the same gag in the graveyard scene of the ride, though the hearse more closely resembles the one from the ballroom. There also is a tree with an owl (with glow-in-the-dark eyes) on a branch. On the left side are two other ghosts: the leprechaun-looking tea-drinker and the infamous hatbox ghost. Both are neat additions, but the latter is particularly cool as he doesn't appear in the ride. The ghost would have his head disappear, then appear in his hatbox, then reappear on his head, and so on. He was even built and put into the ride, but pulled at the last minute - the "back and forth" effect of his gag was never perfected, so rather than display a disappointing shortcoming to audiences, he disappeared entirely. No one really knows what happened to him after that. The roof features two chimneys, which is a cool touch as the actual Mansion is reported to have something like 4 to 8 (yeah, I'm ashamed that I can't remember, too). Up there with the smokestacks is a really bizarre Bride figure. The back of the Mansion features several headstones, some more trees, and the same characters as the snowglobe, even a very globe-esque tomb for the Caretaker and skeletal arm. One thing is for sure: this piece is definitely in the same style/vein as the snowglobe and was almost asuredly made by the same person/people. 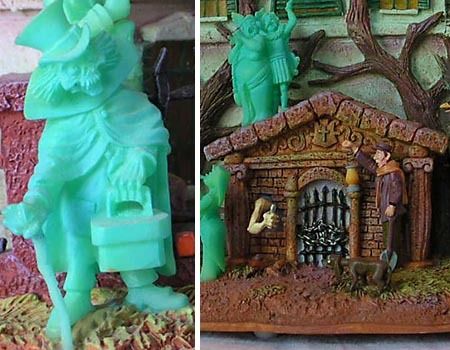 In fact, it even reuses some of the figures; the three Hitchhiking ghosts, the ravens, the owl, the opera couple, the three band members, the skeletal arm, the Caretaker and his dog are all the same sculpts from the snowglobe, just reduced to fit this scale. Therefore, there are ultimately only four (out of a possible 18) new characters on this piece, but I ain't complainin'. The cool stuff for this one? The tree branches are actually fiber optics wrapped in brown tape, or something. Plus, the windows are all translucent yellow, so when the switch is toggled, the windows and tree-branch-tips illuminate. Not groundbreaking, but a cool little feature to be sure! 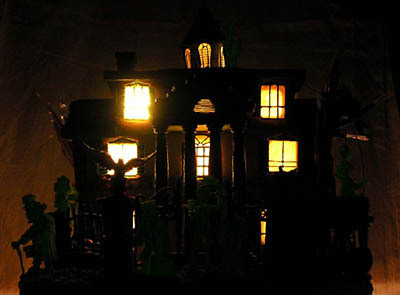 The bottom of the piece even has a hole cut in it and the set includes a removable light bulb/fixture that can be plugged into a regular socket to constantly illuminate the Mansion (sorry, but the fiber-optics are only available with the battery-powered switch). Sculpturally, this thing is similar to the snowglobe: it's not very accurate, but it definitely has some really good detail work and creates a style all its own. The same goes for the paint. The ghosts are done in glow-in-the-dark yellowish green with an airbrush of light blue over it, so while these ghosts don't light up, they sure as heck glow! All in all, this is really one of my favorite Mansion collectibles. It's not very accurate ... to anything, but it has its own style that is visually pleasing and evident throughout the entire piece; giving it its own sense of ... self. I think this thing retails for around $100, though it's been on eBay for as low as $40. If you can afford it, I'd say get it; especially if you're a Mansion fan. Are you impressed by Rustin's nigh-encyclopaedic knowledge of the Haunted Mansion? Tell us on our message board, the Loafing Lounge.